I feel like a young fella who has discovered a buried treasure! After so many years of working with timber frames and old barns, the magic of each newly discovered frame never dies! This past week, I got to work on an old Gunstock Timber Frame whose labeling system goes back to the 1500s and earlier. Now if we were in England, this might not be such a big deal. 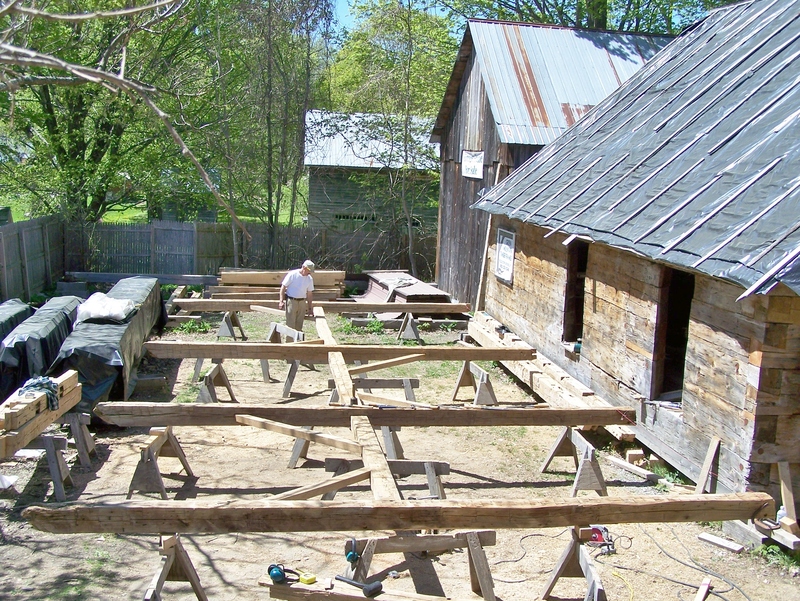 But we’re talking about a labeling technique that was brought across the Atlantic to rural Vermont – and this timber frame is a real, rare find in our community! Here are a few photos that show the details of the beauty – the handicraft of an expert timber framer who lived in New England centuries ago. 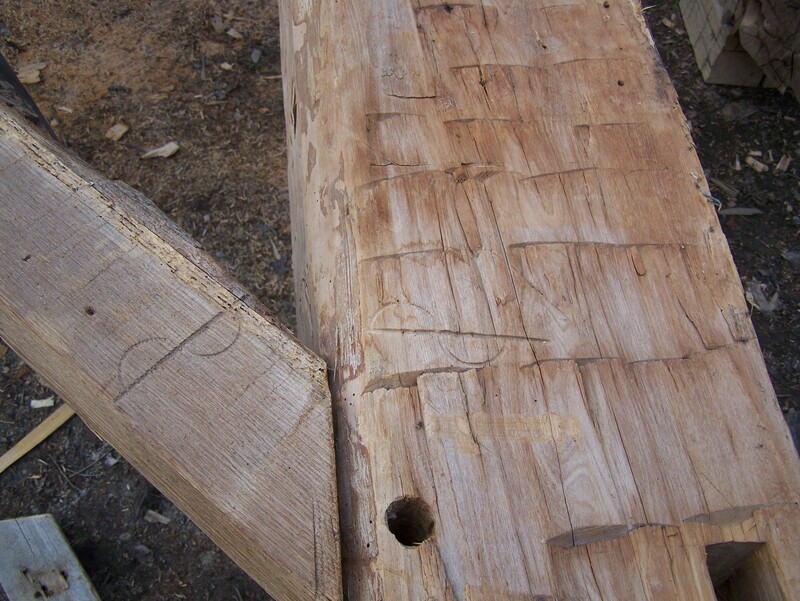 In the photo above, we can see the labeling technique of the old world joinery, brought to New England where it was used until the mid 1800s. Below is an excerpt from Richard Harris’s book, “Discovering Timber-Framed Buildings.” which explains the old world joinery and labeling system. 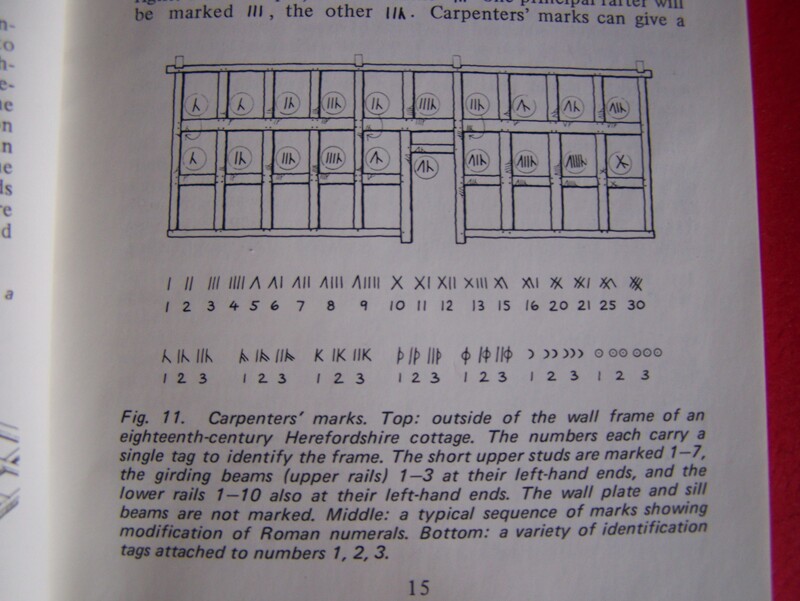 The first picture below shows the traditional lettering system used to label timber frames. The second picture shows a detail of the joinery that this original timber framer used. And below we see the frame I worked on this past week – an up close photograph of the joinery on this beauty of a frame! This frame is classified as a Gunstock frame because the posts that hold it up are tapered from bottom to top in order to allow two timbers to join and overlap at the top of the post. The top plate timber – or rafter plate – will fill the gap on the right side on raising day. Below is a picture showing the principal rafters of the frame. 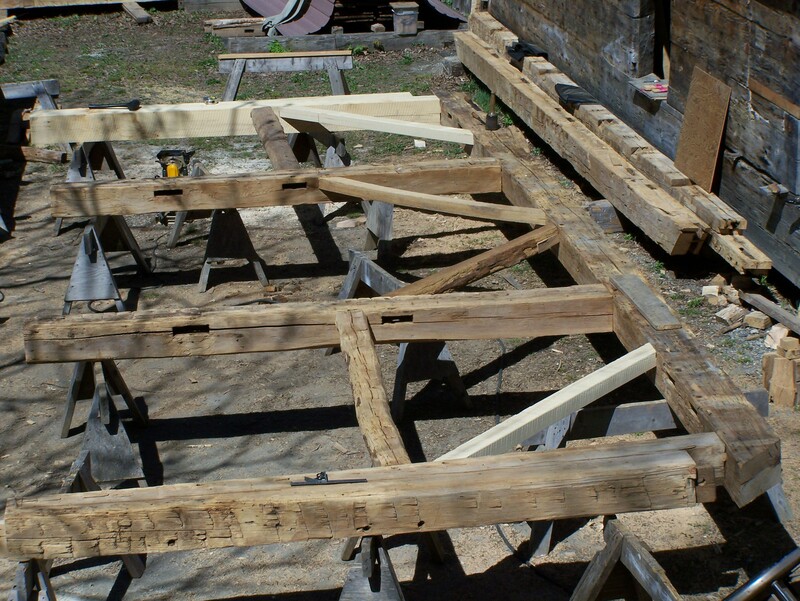 The girts – or long timbers – on this frame are made from Elm and Chestnut. The midbay timbers were originally 30 feet wide, but restoration allowed 25 feet. It was hard to tell what wood it was until the cutting, but the familiar pungent smell helped me recognize the Elm. 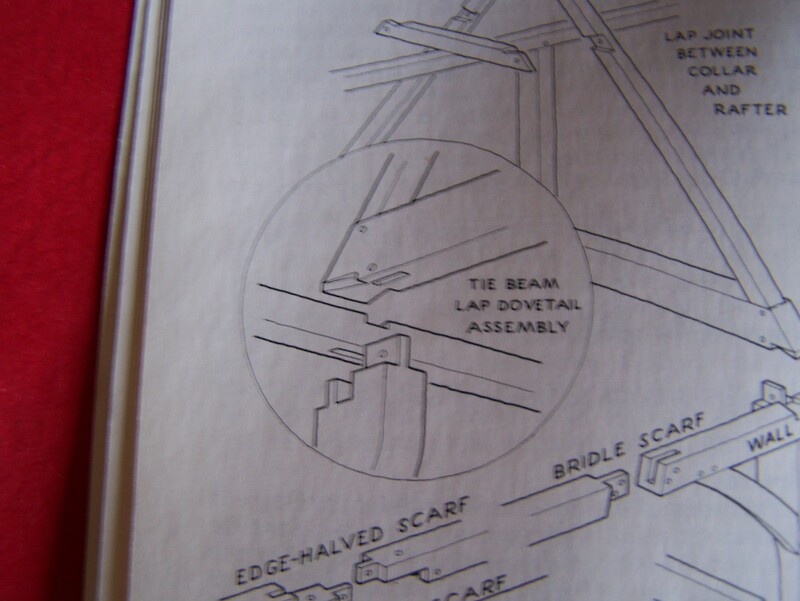 The picture below shows the gable (or end wall) section of the frame. 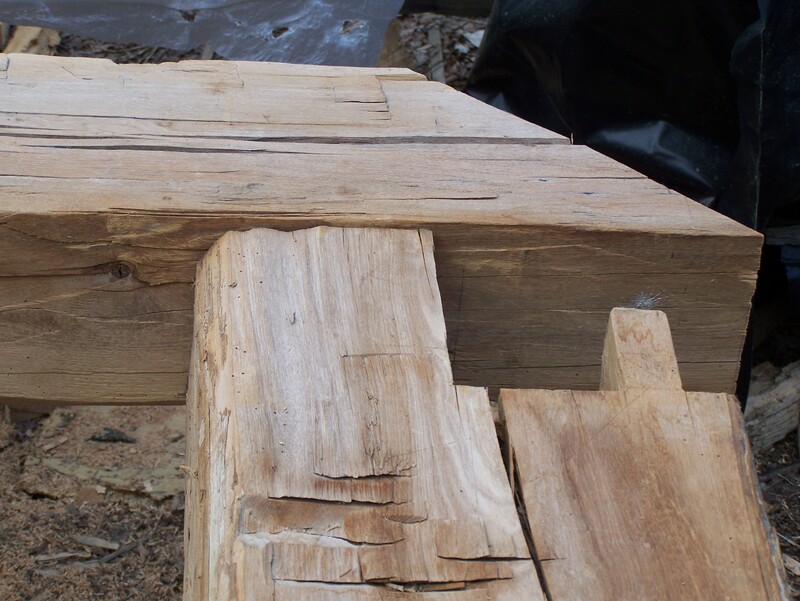 Some new timbers have been added, and will age nicely over the next 200 years. This final picture shows the frame’s roof structure. We are assembling the original half of the roof frame before adjusting it to new dimensions. And here we have it – another piece of history uncovered. A fine example of “post medieval construction”, when buildings where built to last for centuries. This entry was posted in Frames in stock, Green Mountain Timber Frames, Middletown Springs, Vermont, Post and Beam and tagged gunstock frame, historic properties, historic timber frames, joinery, timber frame, timber frame joinery by Green Mountain Timber Frames. Bookmark the permalink. Yes, early on I was having this problem you describe. However, my design folks did their magic and the problem went away. You could contact them. Their name is at the bottom of my web site. it may not be a taboo matter but typically folks don’t talk about such subjects. Bridgett, thanks for commenting. We are fortunate in New England to have such early examples of “Post Medieval Construction”. Like the Redwoods, most are lost to ignorance or chainsaws and bulldozers but we save what we can in our area communities. We are currently restoring a 1775 frame from Ira Vermont. 15 years newer than the one you commented on. It’s the first frame where I discovered the diagonal braces are hewn rather than sawn. They only wanted to pay the saw mill for the wide roof and siding boards. Hew everything else on the farm……………..How hard they worked to create their buildings. All we do is spruce them up and they are good for another 250 years! Great items from you, man. I have understand your stuff previous to and you are simply extremely magnificent. much more from you. That is really a wonderful site.